No Filipino meal is complete without these. No matter how delicious your ulam is, it just doesn't seem complete without a dip. A typical Pinoy sawsawan ranges from classic ones like soy sauce with calamansi to the inventive ones like ketchup with soy sauce and chili. But do you know your dips well? Check out the list below to learn more about your favorites. Vinegar or suka is a staple in the kitchen, thanks in part to its high levels of acidity and overall versatility. 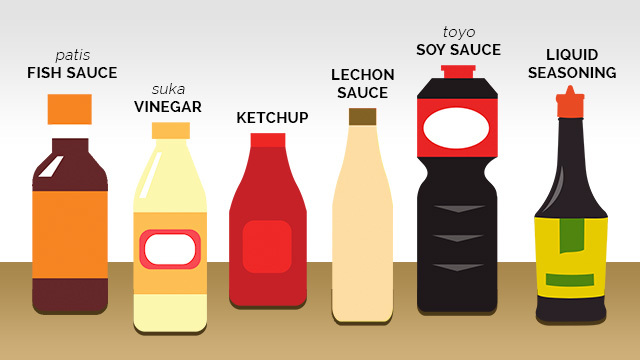 Most Filipinos keep a bottle of either distilled white vinegar or cane vinegar in their kitchens to use either as a condiment to go with fried foods like longganisa and tuyo, or as a main flavoring agent in dishes like adobo, kinilaw, and even atchara. Most Pinoys often use pungent fish sauce or patis in place of salt to season their food, such as soups and stews like tinola and sinigang, in order to add another layer of flavor. Patis is made by collecting the juices from barrels of slowly fermenting anchovies. Originally from China, soy sauce or toyo is a deep brown sauce made by fermenting soy beans with wheat and salt, and pressing them through a sieve. Thanks to its salty umami flavor, soy sauce is often paired with sharper, sour condiments such as calamansi, red chillies or vinegar and is most commonly used in making dishes such as adobo. A staple in parties and fiestas, lechon sauce is a thick, sweet condiment made of finely chopped liver, vinegar, sugar, and pepper. It is usually served alongside lechon (hence the name) and can be used to make lechong paksiw often using leftover lechon. While not necessarily an exclusively Filipino condiment, sweet chili sauce is fast becoming a local staple. Originally from Thailand, this sweet and slightly spicy sauce pairs well with oilier fried Filipino foods like lumpiang Shanghai and whole fried fish. A crowd favorite, banana ketchup is a sweet and spicy bright red sauce made of bananas and a handful of spices. Often served with tortang talong and barbecued pork, banana ketchup was said to have been invented in the 1940s when there weren't enough tomatoes to produce regular tomato ketchup. It's a common misconception that liquid seasoning is soy sauce, but it's an entirely different condiment. It has a distinct umami taste with a hint of tamis-alat, that instantly enhances the flavor of your dish. It's a great dip, a delicious flavoring for fried rice, and a good topper and marinade, too. Curious about cooking with liquid seasoning? Try recipes with Knorr Liquid Seasoning. It's perfect for fried rice, sauteed recipes, and grilled meats. Do you have a favorite sawsawan that isn't on the list? Share them here! 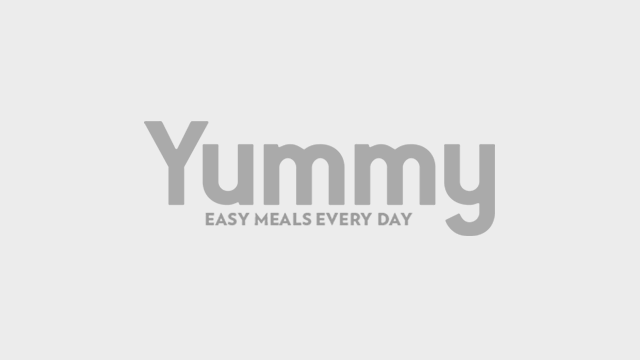 This article was created by Summit StoryLabs in partnership with Knorr Liquid Seasoning.